Optoma HD20 review | What Hi-Fi? 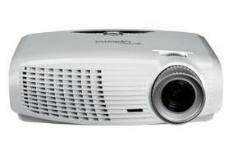 This is one of the cheapest and smallest projectors in its class – shaving a few millimetres off the BenQ W1000 here and there – meaning it should be just about as easy to accommodate as you're going to find when it comes to projecting a big picture on your wall. As befits a more compact – indeed, you could almost say portable – design, the Optoma HD20 is far easier on the eye than most rivals, which is handy considering you may well find it placed within your field of vision. The Optoma is comfortably at home on a coffee table. That said, we didn't find it quite as easy to set-up as we expected. The HD20 eschews the hands-on manoeuvrability of some rivals; it's a little more clunky to control, with the lens shift being a fiddle to get just right. The throw ratio could be more flexible, too. Nevertheless, once you're up and running, the Optoma has everything else at its disposal to get solid results. It's a 1920 x 1080 Full HD resolution DLP projector, complete with two HDMI inputs, ready to receive HD content. It runs reasonably quiet, but the 29dB rating in normal operation is no match for the quieter fans of larger rivals – at around 21dB for the Sanyo PLV-Z700, for example. We give the Optoma the best possible start by kicking off with the superb Blu-ray transfer of Life, and the image before us is certainly none too shabby. Dark levels are true and solid, while the level of insight is good, if not as sharp and revealing as the best about. The colour balance is on the eager side, with some of the admittedly fantastical colours of the diverse animal life on show looking slightly too out of this world to our eye. The DVD of The Hangover shows the projector capable of handling fast motion smoothly, while the level of detail delivered is again more than acceptable for a projector at this pricepoint. But more than acceptable isn't quite good enough in this pice class. If you're after something affordable and compact, or to place close to your screen, then Optoma's HD 20 is well worth investigating; but if it's absolute home cinema performance you're after, you can spend only a little more on the likes of Sanyo's £1100 PLV-Z700 to see a better picture.